Until recently, business intelligence product vendors have focused mostly on improving their reporting and analytical processing. Although this increased functionality has benefited power users, such as business analysts and information workers, it has not effectively encouraged the use of business intelligence by less experienced users. Common examples of this are business executives and line-of-business (LOB) managers. The tide is now turning, however, as vendors seek to expand the sales of their solutions to a broader user base. There is now more awareness by business intelligence vendors on the need to improve the usability of their products. They are now listening to customer complaints about the need to reduce IT workloads. Customers feel this will enable business to become more self sufficient through self-service applications. They are beginning to realize that Microsoft Office and Excel are successful, not only because of Microsoft’s dominance, but also because less experienced users find these products easier to use than other business intelligence tools. The movement toward improving usability is evident from several of the major business intelligence vendors as evidenced by their upcoming product releases. There is now improved integration with Microsoft Office, increased support for business portals, and a focus on today’s favorite buzzword—the business dashboard. Given this trend, it is important to understand the relationship between business dashboards, business portals and collaborative products like Microsoft Office. The best approach to examining usability is to start with business user requirements. Today, business users must have a personalized workspace (see Figure 1) for a collaborative environment. This workspace will give them the ability to access all of the business content needed to perform their daily tasks. The business content may consist of business processes and workflows, business applications and/or business information. In turn, the business information may come from operational systems, business intelligence applications, content management systems or a collaborative environment. This business workspace is provided by a business portal. Running a stored business intelligence object (query, report, analysis or model), business intelligence tool or application. Searching for business intelligence objects (queries, analyses, reports, templates, models, results, metadata, etc.) and business information. Navigating a business intelligence (metadata) object tree; drilling up, down or across business intelligence results; or following web links to related information or applications. Collaborating with other users or groups via e-mail, instant messaging, live meetings, etc. ; or sharing information with other users or groups. Business intelligence is delivered to a business user workspace using a business dashboard. A business dashboard provides access to the services of underlying business intelligence tools and applications. The objective of a dashboard is to hide the complexity of the business intelligence environment. 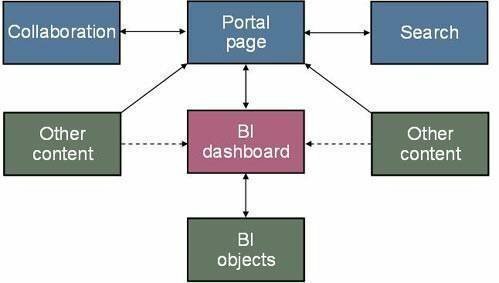 The relationship between a business dashboard and a business portal. 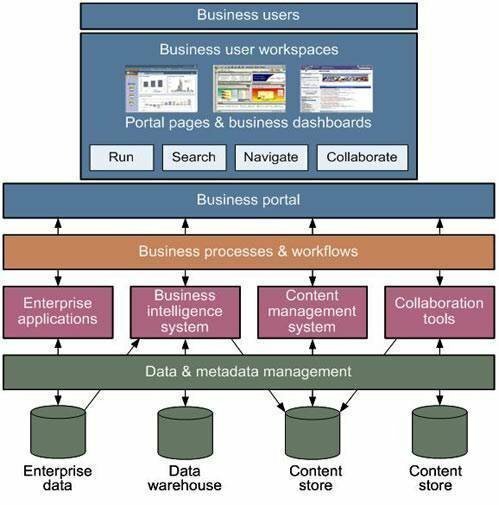 A business portal provides access to business content (using the run and navigate tasks) and offers search and collaboration capabilities. Similarly, a business dashboard provides access to the business intelligence environment (also using the run and navigate tasks) and sometimes related business information. Searching and collaboration should be done using the business portal, rather than the business dashboard, unless the search and collaboration services can be shared by both the portal and dashboard environments. One issue here is that some business intelligence vendors now offer their own collaborative tools, which are specific to the business intelligence environment. I believe this is the wrong approach to collaboration. The new Microsoft Business Scorecard Manager 2005 is one of the best demonstrations of an integrated business user workspace and business intelligence environment. This product not only provides a powerful and competitive business intelligence scorecard and dashboard environment, but also tightly integrates with the Microsoft Office and Microsoft SharePoint portal environments. Products supported by this include Excel, Visio, Project, InfoPath, SharePoint, MapPoint, Access and Analysis Services. In summary, improving the usability of business intelligence solutions involves integrating business intelligence dashboards with business portals, while adding a collaborative environment. As you evaluate new business intelligence vendors’ offerings, one should determine how well their new usability capabilities can support a personalized business user workspace. Your Performance Management or Business Intelligence Platform – Is it Frozen in Time?